John Adams was an American politician. 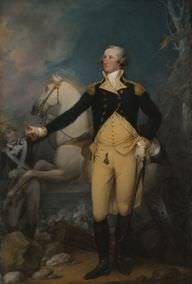 He served as the second President of the United States from 1797 to 1801. He was a lawyer and one of the Fathers of the United States of America, who led the American Revolution against the authority of Great Britain. He was the author of the Massachusetts Constitution in 1780 and he signed the "Alien and Sedition Acts" bills. He disliked slavery but did not oppose it politically. He is regarded as the father of the American Navy and was mainly responsible for the Declaration of Independence in 1776. He was married to Abigail Smith and they had 6 children. John Adams was a famous American politician, who was born on October 30, 1735. As a person born on this date, John Adams is listed in our database as the 1st most popular celebrity for the day (October 30). People born on October 30 fall under the Zodiac sign of Scorpio, the Scorpion. John Adams is the 49th most popular Scorpio. Aside from information specific to John Adams' birthday, John Adams is the 363rd most famous American and ranks 6th in famous people born in Quincy, Massachusetts, U.S. In general, John Adams ranks as the 615th most popular famous person, and the 20th most popular us president of all time. “The Famous Birthdays” catalogs over 25,000 famous people, everyone from actors to singers to scientists to serial killers and more. If you're curious to see who was born on your birthday, you can use our database to find out who, what, where, when and why. You can search by birthday, birthplace, claim to fame or any other information by typing in the search box, or simply browse our site by selecting the month, the day, the horoscope, or any other clickable option. 6th born in Quincy, Massachusetts, U.S.